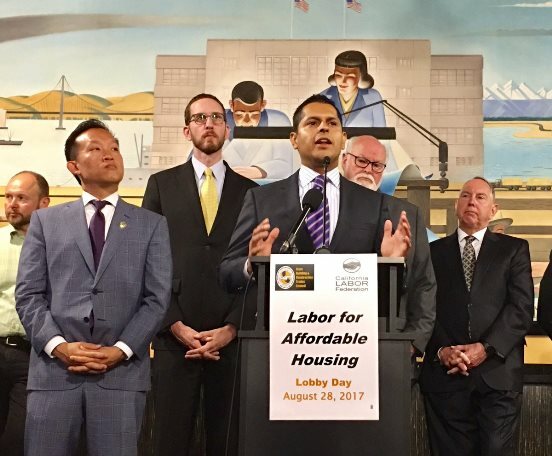 Los Angeles dominates the California Legislature but two San Franciscans—State Senator Scott Wiener and Assembly member David Chiu—are playing key roles in the fight for state affordable housing funding. Wiener is the lead sponsor of SB 35, the state’s biggest pro-housing bill in decades; Chiu is co-sponsor of AB 1505, which overturns the Palmer court decision that city attorneys in Oakland, Los Angeles and San Jose have interpreted to bar inclusionary rental housing. The success shown by both legislators is surprising for different reasons. I doubt even Scott Wiener’s strongest backers in his 2016 state senate campaign expected him to get the most significant housing reform bill enacted into law in his first year. Nobody gets such big bills passed in their first year, and it was just last year that a similar legislative effort crashed and burned. But Wiener’s SB 35, which streamlines the approval process for housing in cities that are not meeting regional housing goals, is certain of passing. That’s because Governor Jerry Brown is totally behind it. Brown found in Wiener’s bill the state legislation he has long sought to address California’s staggering housing shortage. I certainly never expected Wiener to have such success in his first year….or in future years. Yes, Scott was smart, a hard worker and a bulldog in pushing legislation. But in San Francisco he displayed difficulty working with colleagues who did not agree with him. I figured that his aggressiveness bordering on arrogance would play even worse in Sacramento, where the egos of legislators are even larger. I was wrong. And I’m very happy to have been wrong. When I’m wrong about a politician it is usually because they disappoint me. It’s a treat to see a politician greatly exceed my expectations. In thinking why I misread Wiener, I recalled that he was a much more agreeable person when he started as supervisor. But politics in San Francisco gets very personal. I think the relentless attacks on Wiener caused him to respond in kind, bringing out the worst in him. Wiener would not be the first San Francisco politician to find a more hospitable environment in Sacramento Mark Leno also became a very different politician in Sacramento. Always considered a “moderate” in San Francisco, Leno became a leading progressive voice in both the Assembly and Senate during his tenure. Maybe San Francisco politics does not bring out the best in people. The overemphasized boundaries between “progressives” and “moderates” may cause personality conflicts; they also restrain voting patterns in a way that does not occur at the state level. Wiener’s chief accomplishment was getting Governor Brown to support affordable housing. Speaker Rendon, Senate leader De Leon, and the constant publicity about the state housing crisis certainly played a role. Big city mayors, including San Francisco’s Ed Lee, also have been more engaged in pushing state affordable housing measures than ever before. But all would be for naught had Wiener not built a relationship with Brown that gave SB 35 the key backing it needed. If you doubt the magnitude of that achievement, talk to a legislator off the record about dealing with Jerry Brown on affordable housing. I know what they will say. We saw last year, when affordable housing got zilch in Sacramento, that making Brown happy about easing local barriers to housing is a prerequisite for any affordable housing measure moving forward. Those opposed to easing such barriers are essentially saying they will accept no affordable housing funding as a trade-off. A trade-off that makes no sense. So hats off to Wiener for getting us to this point. The $4 billion housing bond, $75 document fee surcharge for housing, and the AB 1505 are not yet done deals. But we would not even be talking about them becoming law if Wiener’s SB 35 had not gotten the Governor’s backing. David Chiu’s key role in state housing funding in 2017 has been a surprise because the word on the street was that Chiu was on the outs with Speaker Anthony Rendon. Multiple sources told me that Chiu had not backed Rendon, which is a bad position for a second-term Assembly member. But those reports were either wrong, or Rendon forgave Chiu, or Chiu’s aggressiveness in pushing a range of housing related bills secured him a key policymaking role. Chiu used his role as Chair of the Assembly Housing and Community Development committee to push several housing bills. None is more important than his co-sponsorship of AB 1505, the “Palmer” fix. Governor Brown is no fan of affordable housing and likes inclusionary housing even less. But getting the Governor to not veto AB 1505 is absolutely critical for Los Angeles, Oakland, San Jose and other cities where the Palmer court ruling is barring inclusionary rental housing. Palmer is a Los Angeles real estate magnate who donated $2 million to Donald Trump’s primary campaign; AB 1505 overturns that misguided court ruling in his favor. When word came out last week that developer TMG Partners were pushing bill-killing amendments and encouraging Brown to veto AB 1505, Chiu sprung into action to defend this critical measure. Chiu has also developed strong working relationships with Southern California colleagues like Richard Bloom of Santa Monica; neither were the progressive choices when they ran for Assembly, but both now aggressively promote affordable housing. The Assembly has long been the arena where tenant and affordable housing bills run into trouble. Chiu has used his key committee leadership to help keep all of the key housing bills moving forward. Last Friday, a vote on the housing package was stalled as at least one Orange County Democrat balked at voting for the $ 4 billion bond. Governor Brown’s legendary negotiating skill is badly needed to get the housing package through, but he chose the week before session’s end to take a week’s trip to Siberia. I kid you not. Brown is in Russia dealing with climate change when California’s ability to increase infill housing—a key strategy against climate change—-is hanging in the balance. It is easier in this non-election year for legislators to make tough votes. If these housing measures do not pass this week, they are done until 2019. And if California Democrats cannot get it done on affordable housing this week, they will have ended an historic legislative session by failing on the state’s most pressing issue.